Greetings! Please accept my sincerest condolences on the recent loss of your ship(s). 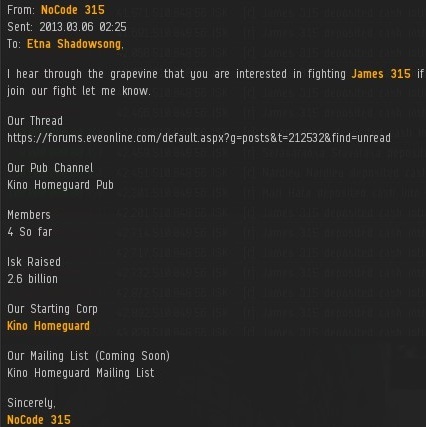 You were killed in the name of James 315 and the New Order of Highsec. You became subject to attack when you failed to abide by the New Halaima Code of Conduct, the set of laws governing all mining in highsec. You are required to obey the Code, which mandates all miners to purchase a mining permit. AFK mining and botting are also prohibited in highsec. Please see www.MinerBumping.com to read the text of the Code and learn more about the New Order, which controls highsec. 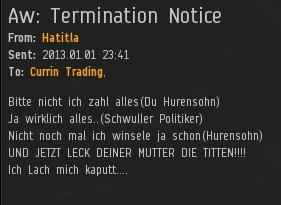 To prevent further attacks, send this character 10 million isk per miner. You will receive positive standings for a period of 365 days. You may also purchase standings for your entire corporation, if you send me 100 million isk. "I pledge my loyalty and support to James 315 and the New Order of Highsec at www.MinerBumping.com"
This was your first warning. Failure to comply may result in additional attacks and a more expensive mining permit. Thank you, and have an incredible day! Yes, it's a long EVEmail, but copy-paste works wonders. I want everyone who gets killed in highsec to receive a free a mini-lesson about the Code. The same goes for bumping. If a miner fails to respond, I will send him an EVEmail after he has been bumped out of range. 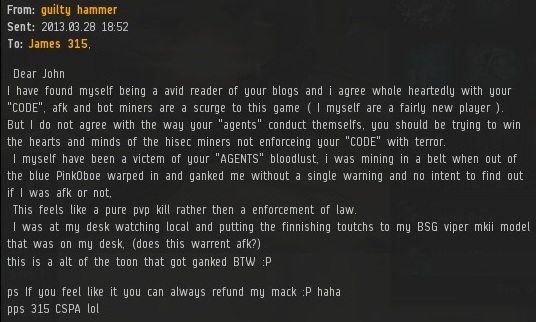 These days, I occasionally get EVEmails from miners who were ganked by my Agents. So far, none of the complaints about my Agents have been valid; my Agents are always in the right. This kept the channel of communication open, so that further progress could be made. 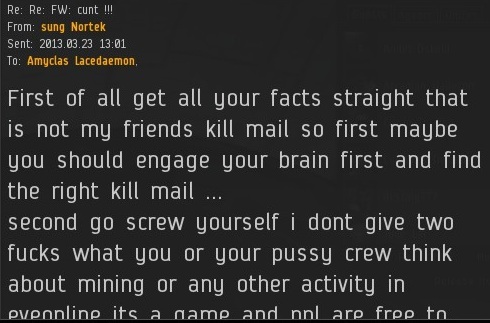 Disputes don't always get resolved, but if even one percent of one percent of miners benefit from these EVEmails, it's well worth the effort. Unfortunately, carebears will take the good faith effort as an opportunity to propagandize against the people who just killed them. But our Agents cannot be so easily turned away from their ultimate goal of a perfect highsec. Very few people know about all the different font options in EVEmail. Maybe that's a good thing, for the power can easily be abused. ...but by late March, Paulina was, well, still unconvinced. Like I said, endurance. Sometimes miners will send reasonably well-written EVEmail complaints or questions about the Code. Though I'm too busy to reply to them, my silence gives them a chance to reflect on what they did wrong. I'm confident that by now, Hogetvedt has already embraced the spirit of the Code and realizes Agent Runeme Shilter was in the right. Then there are the intercepted communications of wayward rebels. The New Order has eyes and ears everywhere, but if not for EVEmails like this one, we would have no idea rebel organizations exist. The written word is a wonderful thing. Awox you say? I have an unaffiliated alt that can be used for such a purpose. +1 internets for getting tears from someone named "You Mad Braw". Galaxy Pig doesn't ride in on a horse. He rides in on a mule. A Galaxy Mule. I have a feeling NoCode 315 could be Mine Teck. new order is illegitimate as ever for unfairly leaving non-english literate players clueless as to why they were ganked. 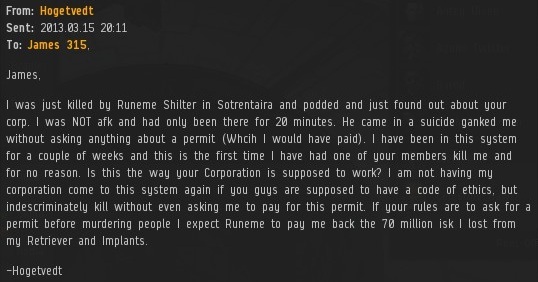 So is EVE Online unfair to non-English speaking players? Because you know, EVE is in English. "So is EVE Online unfair to non-English speaking players? Because you know, EVE is in English." Of course, there are hundreds of languages in the world, and EVE only offers 4. 1 and 4, out of hundreds, both round to 1%. What any of this has to do with 'legitimacy' is quite beyond me. Just because none of this makes any sense whatsoever is no reason to make incorrect factual statements, though. Point taken on that one, my native language is not included in those four. The factual statement was incorrect. I also agree about the nonsensical discussion about legitimacy. But my point was that in an international online game is to be expected that interactions between people from different countries will be in english. Clueless as to why they were ganked? Perhaps it had something to do with the fact that they were playing world of tanks at the time.